On Wednesday, former Panthers defensive end Charles Johnson announced his retirement from the NFL. We heard rumblings that Johnson would retire this year, but those plans were not formalized until now. Johnson was long considered to be one of the better pass rushers in the league. 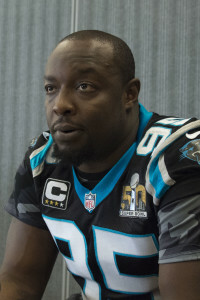 Selected by the Panthers in the third round of the 2007 draft, Johnson showed flashes of promise during his first three years in the pros and broke out when he was given the chance to be a full-time starter in 2010. During the 2010 season, Johnson put up 11.5 sacks and secured a six-year, $72MM extension from Carolina the following offseason. He mostly lived up to that payday over the early stages of the contract, as he posted 32.5 sacks during the 2011-13 seasons. He added 8.5 sacks in the 2014 campaign and, although he missed some of the 2015 season due to injury, he notched three sacks during the Panthers’ playoff run that year, including one in Super Bowl 50. Things changed in 2017, however, after Johnson underwent back surgery. He failed to produce a sack in eleven games, and he was hit with a PED suspension in December. After the Panthers cut him earlier this year, there was no reported interest in the 32-year-old. Johnson leaves the game after spending eleven season with the Panthers and registering 67.5 sacks. We wish him the best in retirement. According to Bill Voth of Panthers.com, longtime Panther Charles Johnson is planning to retire, he just hasn’t made it official yet. However, Voth says that if the team were to make overtures to Johnson, the Georgia product would not hesitate to come back. Not too long ago, Johnson was one of the better pass rushers in the league. Selected by the Panthers in the third round of the 2007 draft, Johnson showed flashes of promise during his first three years in the pros and finally broke out when he was given the chance to be a full-time starter in 2010. During the 2010 season, Johnson put up 11.5 sacks and landed a six-year, $72MM extension from Carolina the following offseason. He mostly lived up to that payday over the early stages of the contract, as he posted 32.5 sacks during the 2011-13 seasons. He added 8.5 sacks in the 2014 campaign and, although he missed some of the 2015 season due to injury, he notched three sacks during the Panthers’ playoff run that year, including one in Super Bowl 50. Carolina released him following the Super Bowl to get out of the last year of his mega-extension but quickly re-signed him to a one-year pact. He then signed a new two-year deal with the Panthers last offseason. 2017, though, was a bad year for Johnson. He failed to produce a sack in 11 games, and he was hit with a PED suspension in December. Carolina cut him earlier this year, and there has been no reported interest in him since. He did indicate before his release that he would like to play in 2018, so perhaps he will get another chance if a club decides it could use a veteran pass rusher later this summer. If Johnson’s career is, in fact, over, he will have nothing to be ashamed of. He has accumulated 72.5 sacks between the regular season and playoffs, he has earned a pile of money, and he got to play in a Super Bowl. He also spent all 11 years of his career with one team, a rare feat in sports today. Shortly after releasing Kurt Coleman, Carolina will release another veteran starter from its Super Bowl team. The Panthers are planning to cut Charles Johnson, ESPN.com’s Adam Caplan reports (on Twitter). This rumored maneuver comes a year after the Panthers re-signed the defensive end for two years and $8MM. It will create $3.25MM in cap space. They will not incur any dead-money charges because of this transaction. Johnson has spent all 11 of his NFL years in Charlotte. The Panthers re-signed him to a mega-extension in 2011 and kept him around on an additional agreement last season. He’ll venture into the free agent market heading into his age-32 season. Johnson started 11 games last season, missing four due to a PED-induced suspension, but did not record a sack. It marked the first time since he was a rookie that this occurred. He has 67.5 career sacks, but over the 2015-16 seasons, only 5.5 of those occurred. Johnson hasn’t produced a season with at least five sacks since he registered 8.5 in 2014. With the releases of Coleman and Johnson, the Panthers created more than $5MM in cap space. This will push the team’s projected total north of $25MM. These cuts will also reduce the number of defensive starters from Super Bowl 50 still under contract to four. That game marked Johnson’s most recent playoff outing. He did not suit up for the Panthers’ wild-card loss to the Saints. Interim general manager Marty Hurney says he would like to stay on as the team’s permanent GM (via Joseph Person of the Charlotte Observer). “I love what I’m doing,” Hurney said. Many in the Panthers organization are rooting for Hurney to get the post on a permanent basis. His one-year deal with the team will expire in June. Panthers defensive end Charles Johnson wants to return in 2018, Person writes. Johnson, 32 in July, has spent his entire 11-year career in Carolina. Last offseason, the Panthers re-upped him on a two-year, $8MM deal that is scheduled to take him through 2018. However, his recent PED suspension absolves the team of any remaining guarantees. Linebacker Thomas Davis knows he may have to accept a reduced role next season, but did not say he would just accept being a backup, Person writes. Davis has a one-year, $6.75MM deal for the 2018 season, but just $1MM of that sum is guaranteed. The Panthers have clinched a playoff spot after their comeback victory over the Buccaneers in Week 16. However, the team’s receiving corps has taken another hit as Damiere Byrd has been placed on injured reserve due to a lower leg injury, according to Bryan Strickland of Panthers.com (Twitter link). The team will likely activate defensive end Charles Johnson from suspension in a corresponding move, reports Joe Person of the Charlotte Observer (Twitter link). Byrd, 24, was just starting to cement himself as the Panthers clear number two wide receiver before suffering the injury. In his second season in the NFL, Byrd had caught nine passes in Weeks 14 and 15, including two touchdowns. He had also solidified himself as the team’s primary kickoff return threat, having already returned one kick for a touchdown this season. Without Byrd, head coach Ron Rivera will likely have to use running back Christian McCaffrey even more in the return game. On the offensive side of the ball, Rivera told Strickland that “it’s tough, but Kaelin Clay has stepped up.” The team also has wideouts Brenton Bersin and Mose Frazier to pick up more snaps in Byrd’s absence. In addition, the team will also get Russell Shepard from a shoulder injury next week. Person further tweets that the Panthers will not be signing a free agent wideout to replace Byrd, instead opting to go with what the team has now going into the postseason. The news certainly puts more pressure on the likes of Devin Funchess and Greg Olsen, who will likely see most of the targets when Cam Newton opts to throw the ball down the field. The Panthers have a chance to take the NFC South with a win and a Saints loss in Week 17. 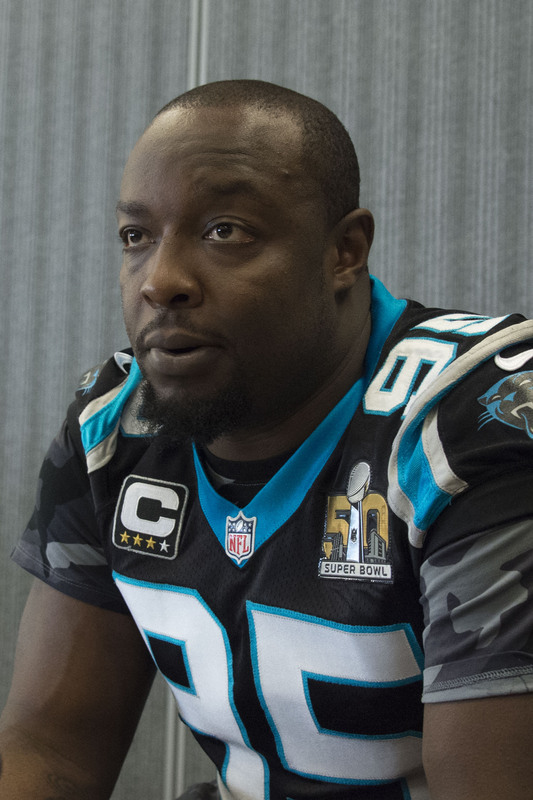 The Panthers announced that Charles Johnson has been hit with a suspension for performance enhancing drugs. He’ll be sidelined for the next four games, as stipulated by the collective bargaining agreement. Johnson, 31, has spent his entire 11-year career in Carolina. This offseason, the Panthers re-upped him on a two-year, $8MM deal that could be worth as much as $9.5MM with incentives. Just a few weeks later, Johnson went under the knife for back surgery. Then-GM Dave Gettleman admitted that the team did not know the full extent of Johnson’s back injury. The injury did not cost him any games – he’s played in all eleven of the team’s contests to date – but his performance has suffered. He currently ranks as the fourth-worst qualified edge defender in the NFL, according to the numbers at Pro Football Focus. After a so-so three months, Johnson has been forced out of action during a pivotal stretch of the season. Two NFL sources tell ESPN.com’s Jeremy Fowler (on Twitter) that they believe Adrian Peterson is still a free agent because his initial price was too high. Fowler adds that the Packers were considering having Peterson in for a visit, but have decided against it for the time being. The Packers reportedly have some interest in Peterson, but they’ll likely wait until after the draft to consider him and weigh a Peterson signing against their other options. After losing Eddie Lacy in free agency, Green Bay’s running back depth chart consists of Ty Montgomery, Don Jackson, and the recently re-signed Christine Michael. Most teams around the league view Giants free agent Johnathan Hankins as primarily being a two-down player, Mike Jones of the Washington Post tweets. That could explain why his own evaluation has been so far off from what the market has been willing to offer him so far. The Dolphins have reached out to Hankins but it’s not clear if they can land him given their budgetary constraints. By the same token, no team seems to be throwing around big money to sign Hankins. He may need to go the Dontari Poe route and accept a one-year deal, but it might come at a lower salary. Panthers GM Dave Gettleman indicated that team didn’t know the full extent of Charles Johnson‘s back injury when they re-signed him this offseason, Joseph Person of The Charlotte Observer tweets. Still, he indicated that wouldn’t have changed the team’s thinking. Johnson had back surgery earlier this week but is not expected to miss regular season time as a result. Panthers quarterback Cam Newton is set to undergo surgery to repair a partially torn rotator cuff on his throwing shoulder, reports ESPN.com’s David Newton. The former MVP is expected to miss offseason workouts, but he should be recovered for the start of training camp. Newton originally suffered the injury during his Week 14 matchup against the Chargers. Newton isn’t the only Panthers player to be going under the knife. Defensive end Charles Johnson had back surgery earlier today, while wideout Damiere Byrd will have knee surgery later this week. The Dolphins signed linebacker Kiko Alonso to an extension earlier today, only a few weeks after the team inked free agent linebacker Lawrence Timmons. Alonso told Adam Beasley of the Miami Herald (Twitter link) that he’s excited to play with the former Steelers defender, noting that he’d be willing to play either inside or outside linebacker. New Rams cornerback Kayvon Webster believes he’ll “definitely” have a chance to start opposite Trumaine Johnson (Twitter link via ESPN.com’s Alden Gonzalez). Right now, Gonzalez believes he’ll have a leg-up over E.J. Gaines thanks to his familiarity with Wade Phillips‘ system. Webster said he would also like to contribute on special teams, depending on how much work he gets on defense. Embattled running back prospect Joe Mixon is set to meet with the Chargers, tweets ESPN.com’s Jim Trotter. The Oklahoma product would undoubtedly be an intriguing fit for Los Angeles, although the team is currently rostering four running backs in Melvin Gordon, Kenneth Farrow, Andre Williams, and Kenjon Barner. 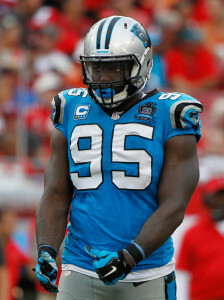 The Panthers have announced the re-signing of defensive end Charles Johnson, meaning yet another edge rusher won’t hit the open market. Johnson can make up to $9.5MM over two years, tweets ESPN’s Adam Schefter. The deal has a base of $8MM before factoring in the $1.5MM in incentives, Nick Underhill of The Advocate tweets. The 30-year-old Johnson made it clear in December that he wanted to remain with Carolina, the only NFL team for which he has played. The Panthers selected Johnson in the third round of the 2007 draft, and he has since tallied 103 starts in 131 appearances, 67.5 sacks and 17 forced fumbles. In 13 appearances – all starts – in 2016, Johnson racked up 26 tackles, four sacks and two forced fumbles to rank as Pro Football Focus’ 25th-best edge defender among 109 qualifiers. The Panthers and Johnson briefly separated last offseason, when the team released him in a cost-cutting move. Carolina shortly brought back Johnson on a $3MM deal, so his new contract represents a nice raise. PFR’s Dallas Robinson pegged Johnson as the eighth-best unsigned edge defender prior to Tuesday.